On November 2, Sunday afternoon, a press conference for 《苏乞儿》 True Legend, directed by Yuen Wo Ping, was held in Beijing. The cast for the film includes Zhao Wen Zhuo, Zhou Xun, Gordon Liu, Michelle Yeoh, Guo Xiao Dong, Andy On, Jay Chow, Will Liu, etc. True Legend official site, containing production diary, character designs, concept arts, stills, videos, news, etc. was made known, and a short behind-the-scene footage was shown. Doubts were raised by the reporters concerning Jay Chow playing a martial arts doyen responsible for raising Beggar Su's skills since he lacks martial arts and acting ability. Yuen Wo Ping, who has some difficulties expressing himself in Mandarin, introduces that True Legend has a good quality script, presenting everything in a well-rounded manner, including character developments, from a happy family to it being torn asunder, to the protagonist regaining his confidence, getting a grip on himself... When he showed the script to his wife, she gave him the encouragement to direct the film. Yuen Wo Ping continues, "While there're some comic relief elements, this is basically a serious dramatic production. It also has very good action scenes and is different from other works on Beggar Su." Yuen Woo Ping adds that being a director is very a tough job, having to take care of everything. Much more difficult than being a martial arts director. It took him 9 months to a year to go through the script, doing pre-production. He feels that when doing something that is difficult, you must do it successfully, or your effort would be wasted. Most importantly, you have to do it wholeheartedly. And he'd come up with something new for each of his films, and accordingly, there'd be quite a bit of surprises in store in True Legend, including "something innovative in the martial arts sequences." On being asked about the budget and release date of True Legend, Yuen Wo Ping says, "I have no idea about the budget, you have to ask the boss. When I direct movies, what I want, the boss must provide, must meet my requests, or I wouldn't do it. Whatever I need, I just have to tell them. The release date? No idea. We'll know after wrapping up." Zhao Wen Zhuo, who plays the protagonist Su Can, says that its the script that attracted him most to True Legend, "It's not often that I see martial arts films with scripts that are so moving. I was so touched when I first read the script, I was moved to tears. The character is very moving, and of course, with maestro Yuen Wo Ping directing, how could you turn down this project? "I've done a lot of preparations for this film. After accepting the role, I began my training. Eighth Master suggested a training schedule, training what he wanted me to do in the film. And most importantly, I had to shed 9kg for the film, for Beggar Su can't be too plump. So I kept up with my training routine and went on a diet. I feel lighter and more agile after losing weight. "I have long heard that Yuen Woo Ping is especially demanding, and I got a taste of it during training, like how you should swing the weapon, where he'd dodge, and you must do a series of action in one single breath, and have to be more careful as such. "I have great expectations for the film, since Eighth Master is the world renowned martial arts director. He hasn't directed any films in many years, so I especially look forward to its release, especially this type of kungfu film." On hearing Yuen Wo Ping was casting her, Zhou Xun wondered if she would get to fight , only to learn that she'd merely be playing a drama role, but "Having left a good impression on Eighth Master in True Legend, I'd get the chance to have fight scenes in future collaborations." Playing Zhao Wen Zhuo's wife, Zhou Xun is very moved by the script too, "This character stirs me immensely, what touches me most is after a major turnabout of events, she suddenly becomes very strong, her husband relies on her encouragements, her love, to grow up. 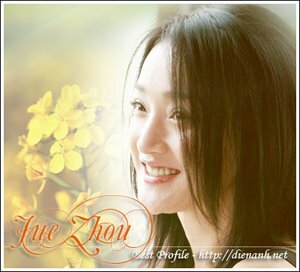 As UNDP China National Goodwill Ambassador, Zhou Xun, who went green after watching An Inconvenient Truth, has been actively spreading word on environmental sustainability and raising environmental awareness in the view of the urgency of climate change, advising everyone on the set to use recyclable products, like bringing their own crockery rather than disposable ones, etc. On a separate occasion, Zhou Xun says, "Statistically, raising livestock for meat is responsible for one quarter of the world's greenhouse gases. Many green organisations are encouraging people to cut down on meat. I'm basically a vegetarian now, hardly taking any meat now, I believe that everyone should try to go on vegetarian diet at least once a week." According to Guo Xiao Dong, he plays an ardently patriotic person, a hot-blooded youth who's inspired by Beggar Su to stand up against foreign invaders. Annd, under Beggar Su's guidance, he rises up in ranks from a foot soldier. Guo Xiao Dong says that he's very glad to be able to work with Yuen Wo Ping and hopes to achieve breakthrough in the film. True Legend, produced by Edko Films, Shanghai Film Group, and Beijing New Times Film Culture and Development, is eyeing a summer 2009 release.